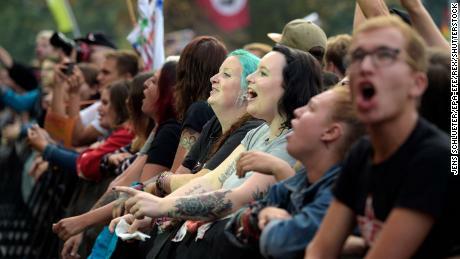 City officials said the "#wirsindmehr" concert, which translates to "there are more of us," drew about 65,000 attendees. 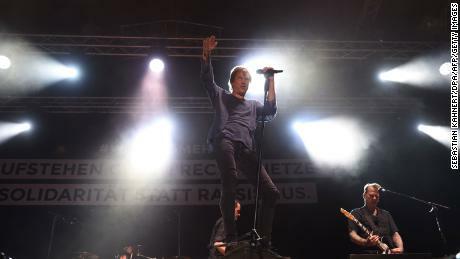 It featured some of Germany's most well-known musicians, including the punk band Die Toten Hosen. 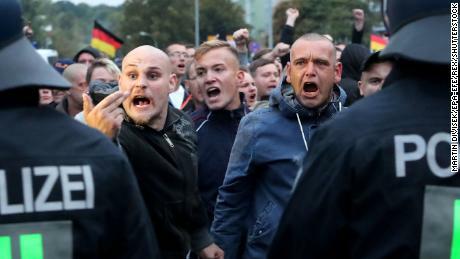 "Thousands of people have been moving through the streets of Chemnitz, exploiting a senseless death for their own purposes and hunting people because of their origin or the color of their skin," the organizers wrote in a description of the event. "Racism should not be left uncontested on the street. 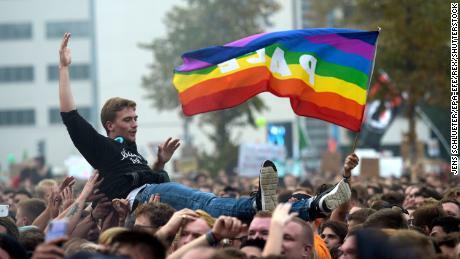 "The concert, which organizers say is not a "festival or a party" but a chance to "show solidarity with all those who have been attacked by neo-Nazis," was to begin with a one-minute moment of silence in memory of Daniel H., the stabbing victim.Images showed a large crowd at the concert, with some people waving rainbow flags saying "Peace" and "Love," and several with signs carrying anti-Nazi messages, such as, "No place for Nazis" and "Nazis, you shall not pass." The concert was being held a day after Justice Minister Heiko Maas said that German society had become "too comfortable" and urged the "silent majority" to speak out louder against anti-immigrant voices across the country. "Sometimes, we must get up from the sofa and open our mouths," Maas said in an interview with German newspaper BILD on Sunday, adding in a tweet: "When the Hitler salute is shown on our streets, that is a disgrace for our country. We must stand up against neo-Nazis and anti-Semites. The silent majority must at last become louder." Maas was speaking during a second weekend of protests in Chemnitz that saw more than 11,000 people take to the streets according to state police — the biggest gathering since the death of the man identified by police as Daniel H.Saxony state police said trains from the city of Leipzig, some 90 kilometers away, were at full capacity, as around 5,000 people commuted to the concert. Following the 35-year-old's death last Sunday, rumors quickly began to swirl in right-wing segments of the online community regarding the identity of his killers. When police announced that an Iraqi and a Syrian man were in custody, those suspicions appeared to be confirmed. Several days of demonstrations and counter-demonstrations followed in the biggest mobilization over immigration in Germany in recent months. 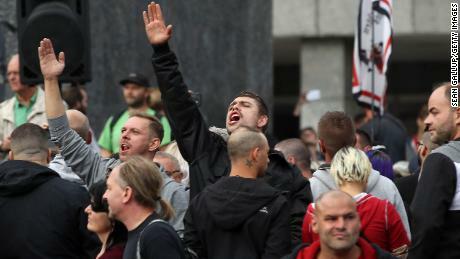 Some protesters were photographed giving the outlawed Nazi salute and others were seen chanting racist slogans such as "Germany for the Germans" and chasing foreigners in the streets.Fault lines between those who welcome and those who reject immigrants have been exposed and become entrenched, with right-wingers accused of exploiting Daniel H.'s death for their own agenda and the opposition criticized for dismissing the anti-immigrant protesters as "Nazis." 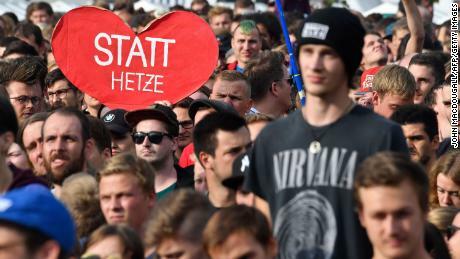 Among those marching on Saturday were thousands of supporters of the anti-immigrant party Alternative for Germany (AfD) and several prominent AfD politicians as well as members of the far-right, anti-Islam Pegida group and local right-wing extremist organization Pro Chemnitz. Many of them had traveled from the nearby cities of Leipzig and Dresden, where support for the far right is also strong. Thousands of anti-fascist protesters were also on the streets, calling for an end to incitement against Muslims and carrying placards with the words, "no place for Nazis. 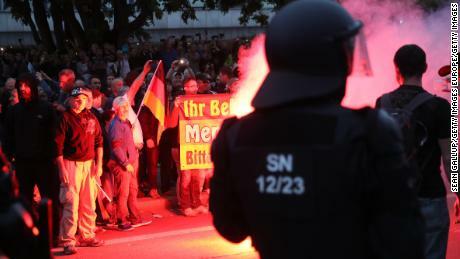 "Following criticism that they had underestimated the numbers likely to attend protests in Chemnitz last week, state police initially deployed more than 1,800 officers and a further 200 were relocated to Chemnitz during the demonstrations. According to police, 18 people were injured and 37 possible crimes are being investigated, including assault charges and property damage. On Sunday, around 800 people took to the streets to march against racism after a call to action by the city's church community. Police said the event was "peaceful and free of trouble." CNN's Nadine Schmidt contributed to this report.